How do I love thee? Let me count the ways. I love thee to the depth and breadth and height… OK, maybe I should stop there. It should come as no surprise that I love Sharp copiers and printers. There are so many benefits they can bring to businesses, and there is nothing I love more than helping companies learn how to save money or improve productivity with their Sharp copier or printer. Through the years, I have also learned why the businesses and organizations we work with love their Sharp copiers and printers. I have put together a list of the top reasons they shared with me. 1. The retractable full-size keyboard that makes it so easy to enter information. 2. The customizable 10.1″ Hi-Def touch-screen display makes it easy to see and navigate menus. This larger touch-screen display is easier to read and navigate than the copier screens of the past, and for that, we are thankful. 3. The SharpDesk scan software that lets me convert paper documents into editable text documents. Administrative assistants rejoice! Gone are the days of being handed a piece of paper and having to retype the entire document to make a few simple changes. Just scan, convert and edit. Voila! 4. The Dual Scan document feeder than scans both sides of an original at once. No more flipping and flopping documents to get a scan of both sides. Have both sides scanned in one fell swoop. 5. The functionality of editing documents on screen and deleting blank pages BEFORE sending. You have scanned in a document to send to someone, but the document contains blank pages. Previously, you had to let go of any OCD tendencies and just send as is. No longer! Remove those aggravating blank pages before you send. 6. The new 1200 x 1200 dpi color! Notice the exclamation point at the end of this one? Many of my customers are pretty excited over this one and so am I. Your documents have never looked this good. It allows you to economically produce professional, high-quality documents with razor-sharp images in-house. 7. The award-winning reliability of Sharp MFPs. No business has time for the copier or printer to crash on them. Sharp multi-function printers have won numerous awards and are known for their reliability. With a Sharp copier there are so many options available to businesses—from expandable memory capabilities to extra paper capacity, and professional finishers to software add-ons. The equipment can be totally customized to meet any business’s needs. 9. The innovation of cloud portal and document management integration. Businesses and organizations are becoming more mobile by the minute. More employees are working remotely and access to smartphones and tablets is at an all-time high. Sharp’s document management options allow your employees to stay connected even when they are not in the office. 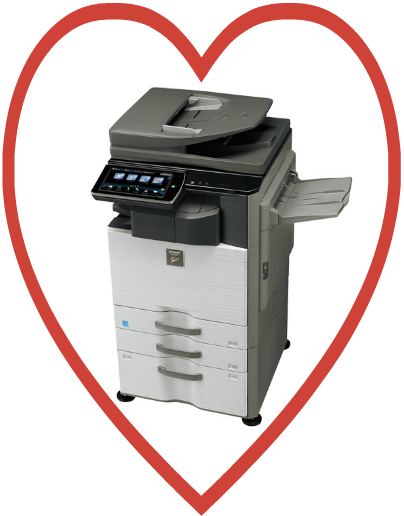 With all of those reasons, what is not to love about Sharp multi-function printers and copiers? If you are located in the Canton, North Canton, Akron, Toledo areas or elsewhere in Ohio, contact us and let us help you find the right printer or copier for your business’s needs. The previous episode of Copiers and Printers: The Next Generation, explored new features you can expect from Sharp in the next year and how these features help boost productivity. In this episode, Tom Kappele, regional sales manager with Sharp Electronics Corp., shares his opinions on trends and what might be coming down the pike in the future with copiers and printers. Despite technological advances, we are a long way from being a paperless society. The number of printed pages worldwide is expected to remain steady over the next several years. As long as there is a need for printed documents, Sharp will develop and market new technology to make it easier, faster and more cost efficient for the customer. When you look at today’s devices compared to 5 or 10 years ago, the end user gets so much more for approximately the same amount of money. Set up automated document workflows to process inbound or outbound paperwork more efficiently. In addition, they print with incredible image quality at a more cost-effective cost per page than ever before. Sharp celebrated its 100-year anniversary last year. We have been successful all these years by continually evolving and adapting to technological advancements and also by listening to our customers. That core philosophy will not change. When developing new products and technologies, end user feedback to the authorized dealer or directly to Sharp is very important. In some cases this input can be used to enhance current products even more quickly through firmware updates. Staying in tune with dealer and end user needs is critical to our long-term success in a very competitive industry. Your feedback is important to us. Share with us your feedback and the features you would like to see in future Sharp multi-function printers. Office spaces, the final frontier. These are the voyages of Sharp multi-function printers and copiers. Their continuing mission: to explore strange new corporations, to seek out new life and new technologies, to boldly go where no printer or copier has gone before. OK, maybe that was a little over the top, but Sharp continues to introduce innovative new printer and copier technology each year. We want to introduce you to the next generation of Sharp multi-function printers (MFPs). Tom Kappele, regional sales manager with Sharp Electronics Corp., shares his opinions below on new trends and features. Sharp has recently released products in a few different categories, and I would expect this trend to continue over the next year. Like many of the manufacturers in our industry, we are introducing products in new market segments and also improving and enhancing existing products to meet customer expectations. Production Color Models: 65- and 75-page-per-minute models with advanced job management tools and color processing capabilities using a Fiery print server. These models open new doors for Sharp and our dealers allowing us to sell color into high-volume production environments. These are our most advanced color MFPs ever. Advanced Digital Display Products: Sharp’s line of Aquos Board Interactive Displays (60-, 70- and 80-inch models) give our dealers an opportunity to help customers in new markets—conference rooms, training facilities, etc. These products are state-of-the-art, high-definition LCD displays that can replace old technology such as projectors, white boards and flip charts in classrooms, conference rooms and more. In the next year I would expect Sharp to release black-and-white models that incorporate some of these same enhancements that our color line-up has seen in the past 6-12 months. Sharp is a leading technology company that is constantly looking to improve existing products, and end users expect us to bring improvements and enhancements to our products. The MFP market has been mature for years, so it’s not seeing growth from year to year in overall unit sales. Our industry is all about improving current technology. Improved productivity using the features mentioned above is part of the overall improvement of technology. These new capabilities are designed to simplify complex printing, copying and scanning jobs and shorten turnaround time. Document management solutions, as mentioned above, will continue to be a focus for Sharp. All current and future products have the ability, using Sharp’s Open System Architecture (OSA), to integrate with third-party software solutions to easily scan and archive electronic documents, automate workflows to improve document processing within an organization, or track MFP usage and seamlessly bill by department using third-party accounting systems. Cloud services are quickly becoming attractive for MFPs, just as they are for day-to-day software solutions in the office environment. End users have the option to pay monthly subscription fees for software rather than purchasing and installing it on their own server. I expect that trend to continue, so we’ll see even greater focus from Sharp on additional cloud services over the next year. Share with us your feedback and the features you would like to see in new Sharp multi-function printers. In Copiers and Printers: The Next Generation, Episode II, we will look further into the future of copiers and printers with Tom Kappele. Here at Copeco, we are always looking for solutions to keep you on the cutting edge of printer and copier technology. Enter Sharp’s Aquos Board, which makes slide carousels, overhead projectors, digital projectors and white boards a thing of the past. This revolutionary interactive display system combines the traditional whiteboard, TV, touch-screen computer and projector, and creates an amazing multimedia center for the board room, classroom or conference center. The video below, from Sharp USA, gives an excellent visual overview of the Aquos Board. As you can see from the video, the Aquos Board allows you to annotate or “write” on your presentations and share them through digital technology with those in attendance at your meeting or presentation. While live annotation of your presentations is a pretty amazing feature, it can provide many additional benefits far beyond this, allowing you to work smarter, not harder. We have broken down several different situations where the Aquos Board can be immensely helpful. Have you ever been involved in a strategic planning session for an organization? It often entails brainstorming ideas, goals and tactics to reach those goals. These sessions usually entail many pieces of paper from easel pads that one lucky person gets to transcribe and send to participants after the meeting. What if you could streamline this process? Preloaded with many commonly used templates such as calendars, action plans, graph paper and to-do lists, the Aquos Board allows you to ditch the paper and transcribing. You are able to create lists on screen during your session, and at the end, save it to a computer and email it to those in attendance. Or, you can send the information to your Sharp multi-function printer and print copies of the information to send to those in attendance. In addition, as you saw in the video, you can bring up existing documents or reports and annotate those during your session. Then, just as with the brainstorming, send or print the annotated version to give to attendees. You save staff time (with no transcription) and are able to get the information to the attendees more quickly. The Sharp Aquos Board simply makes your presentations to look better. Have you ever given a PowerPoint presentation that is projected on a screen and the color or focus is just a bit off? With spectacular HD clarity, backlit design and Sharp’s Uv2A photo-alignment technology, your presentations have never looked this great. And, even better, your presentations have never been easier to read by your audience. Would you like to zoom in on a particular slide or document in a presentation? The Aquos Board’s touch screen works much like that of a tablet or smartphone. You are able to quickly zoom in or out with the swipe of your hands. As you are giving your presentation, highlight key points, make annotations or emphasize topics with your finger or Sharp Pen. Just like in the example above, you are able to save the annotated presentation and send it to those in attendance. This is particularly helpful in training environments. With the annotated version, trainees are able to refer back to the presentation in the future for those key points. If you have team members in different locations, the video conferencing capabilities cannot be beat. While viewing the presentation, all participants can write on the screen images for real-time interactive participation. Again, the annotated version of this presentation can then be easily sent to all participants. The Aquos Board can also be used in a similar fashion for webinars and teleconferences. Want to take an Aquos Board for a test drive? If you are in the Canton, North Canton, Akron, Toledo or elsewhere in Ohio, contact us. We would be happy to show you all of the Aquos Board’s bells and whistles. Purchasing new copiers and printers for your business, school or church can rank up there with other costly capital expenditures. After all, you want to choose office equipment that will meet your changing needs for years to come. When I have to make a big decision about a product or service, I usually start by reading reviews. I want to see not only how others have rated the product I’m considering, but also how they’ve successfully incorporated it into their life and workflow (or not). The dreaded help manual. Just about every copier or printer has one, but rarely do we reach for it when troubleshooting or trying to figure out a new feature. Why? It’s so much easier to Google the answer. However, with a billion results (most often in written form), it can also be time consuming to find what you need via search engines. Sometimes, you just want someone to show you. FAQ: What Is the Best Copier for My Business? This is one of the questions that begins nearly every conversation I have with a new client. How do I choose the right copier for my organization’s needs? It doesn’t matter if you own a small business, manage a department in a mid- to large-sized company, or run a church or school office. You still need a copier, printer or all-in-one machine that will do everything you need it to do at a price you can afford. The first place I always start is by asking, “What needs do you have that aren’t currently being fulfilled by your printers and copiers?” So, you should start there, too. Create a list of must-haves, as well as printer options you’d like to have. In most cases, you’re probably ready for functionality you didn’t have before, like scanning, stapling or three-hole punching. But maybe you aren’t sure of all the amazing things today’s advanced printing technology can do. Be sure to ask! Some options that were add-ons several years ago now come standard, which is always an added bonus. The next thing to consider when you’re picking out a new printer is black-and-white copies vs. color copies. Determine how often you’d like to make color copies. This whole issue has changed dramatically over the past decade. Just a few short years ago, 90% of what I sold was B&W printers. Today, it’s just the opposite. Color printing has become more and more affordable. I can find a table-top or multi-function printer with color that will fit just about anyone’s budget. If you’ve been outsourcing your color printing, this may be the perfect opportunity to bring it in house. And speaking of budget, what’s yours? That is the next issue you need to consider when trying to pick the best printer for your organization. Most people typically have a budget in mind for leasing or owning a printer, as well as expenditures on parts, supplies and service. Finally, you’ve got to think about printer speed. This is THE defining aspect of copiers and printers today. Figure out how often you will use your copier and how many copies/prints you want make at one time. Sharp has 15 different models currently, running the gamut between 20 pages per minute and 110 pages per minute (i.e., production print equipment capable of 70,000 to 200,000 copies per month). Color is slightly slower. Basically, if you run a lot of copies every day, you don’t want a slow printer. People who are used to 90 pages per minute will not want to go down to 60 pages per minute. It’s a balance between the cost of the printer and the value of your time and productivity. Of course, you don’t want to forget about service. It’s critical to getting the most out of your printer. Assess the kind of printer service and maintenance you want. In this area, you always get what you pay for. Make sure you choose a copier and printer company that has well-trained techs and top-notch service standards. Other options you can consider include managed print services, which will ensure maximum efficiency on all levels across your entire fleet of printers. So, if you’re part of a business, church or school in Northeast or Northwest Ohio – including Canton, Akron, Toledo and surrounding areas – and looking for a new copier or all-in-one printer, give me a call. I’ll be happy to walk through this entire process with you. Together, I’m sure we can find the exact right printer for you. https://copeco.com/wordpress/wp-content/uploads/logo.png 0 0 Randy Hudson https://copeco.com/wordpress/wp-content/uploads/logo.png Randy Hudson2012-09-20 08:08:102018-03-19 09:19:50FAQ: What Is the Best Copier for My Business? Summer is coming to an end and parents and students have begun to prepare for the classroom with purchases of notebooks, laptops and other school supplies. Similarly, schools and colleges, would benefit from shopping a bit to update their copiers, printers and other essential equipment in an effort to increase productivity while reducing cost. In the paper-intensive world of education, educators and staff must manage a large volume of materials, from classroom handouts to administrative data. Yet many of these institutions usually operate with smaller budgets while still being expected to produce high-caliber work. The need for reliable yet economical resources puts a premium on the equipment schools select for their copying and printing needs. Copiers are one of the most popular tools used daily by teachers, administrators and other institution officials. The dedicated team at Copeco has been managing the equipment, repair and product costs for learning institutions for many years. With the development of digital technology, schools are offered a number of high quality services, from advanced document scanning and transmission of data to e-mail and desktop faxing, and our Sharp Digital Imaging products have been leading the way. From small desktop units to large multifunction units with a 6,600 page capacity Copeco has the right solution for your organization’s needs. As always, Copeco is dedicated to providing the highest quality product and service to our customers and we welcome you to review the line of Sharp digital imaging products we recommend for educational institutions by going to https://www.copeco.com/ind_products.php?ind=11 or contacting your Copeco sales representative.